I recently wrote of my experience this past July 4th drinking what I believe to be the best wine ever made, a 1962 La Tâche from Domaine de la Romanée-Conti (also known as “DRC”), which was shared by my dear friend Burt who happened to be one of the world’s great wine collectors. What I did not get to mention was that Burt was suffering with a terminal illness. Although his health had steadily worsened over the past few years, neither his family nor I envisioned that a mere two months after the La Tâche dinner we would be attending his memorial. The 1962 La Tâche, it turns out, was his goodbye wine. The story, however, is not as sad as it sounds, as Burt and the way he approached wine serves as a reminder of why we winos are so drawn to the vintner’s art. He epitomized what I think of as a wine lover’s special spirit of generosity, an impulse for sharing that is inherently encouraged by the happy fact that one bottle contains multiple servings. To declare Burt a sharer, however, is like characterizing a lion as a cat: technically correct but vastly understating the scope. Over many years, I watched how in his unassuming, courtly way, he would share glasses of his priceless wine with everyone from captains of industry and former U.S. Secretaries of State to grateful waiters, maître d’s, even occasionally a curious coat check attendant. If there was wine left over after a restaurant meal, he would quietly send the unfinished bottles of mythical wine back to the entire kitchen, much to their gleeful astonishment. I still can hear the jubilant roar that emanated from the kitchen of a Palo Alto Greek restaurant when a half dozen half-full treasures were sent back to the chef and his team. Sharing brought Burt great pleasure; he did not talk about it, but it registered on his face. Burt also thought big. He was the only collector I have known who would buy the world’s greatest dessert wine, Château d’Yquem, in a discombobulatingly swollen six-liter size, which looked like a golden battering ram and telegraphed not just generosity but the intent to provision a small army. 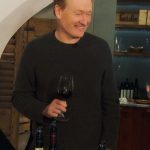 He was so legendary that one day when we were at an event, Conan O’Brien sought him out because he had heard that Burt had opened a rare bottle of vintage port that happened to be from Conan’s birth year, 1963. Burt, then almost 80-years-old and happily oblivious to all facets of pop culture, poured Conan a healthy glass having no idea of whom he was except for his unusual name. 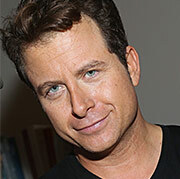 “Mark, this is Conan,” Burt said matter-of-factly as he introduced me to the 6’4″ comedian. I shook Conan’s hand, looked up — way up — in the direction of Conan’s ginger bouffant, and assured the comedian that I was a big fan. With Burt’s outsized magnanimity, it was easy to think that the 1962 La Tâche we had as just another sublime bottle. In retrospect, however, there were subtle signals that suggested otherwise. About a year ago, his oenophilic grandson took me aside and made an observation that only a true grape nut would appreciate. He noticed that his grandfather, without announcing it, was no longer just sharing world-class Burgundies from excellent vintages but producing long line-ups of such wine from legendary vintages such as 2005, 1990, and 1985. An intensely private man, Burt would never tell you about how far his illness had progressed, but his choice of wine did. An intensely private man, Burt would never tell you about how far his illness had progressed, but his choice of wine did. A murderers’ row of Echézeaux. Indeed, with unspoken urgency, in the days leading up to the 1962 La Tâche there were dinners with dazzling bottles set up like bowling pins, each of these nights focusing on a particular grand cru vineyard of Burgundy. First there was a repast with 10 bottles of Richebourg from the likes of DRC, Méo-Camuzet, and Leroy. 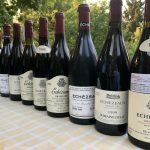 Two nights later we experienced a murderers’ row of Echézeaux, an eye-popping 11 bottles in total, featuring the producers Henri Jayer, DRC, Dujac, and Emmanuel Rouget. 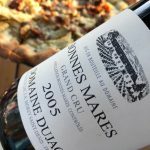 Dujac Bonnes-Mares at Howie’s Pizza, Palo Alto. Displaying his trademark disregard for pretension, Burt held a third gathering at a highway pizzeria, where at a table outside amid the ruckus of a child’s birthday party and the zoom of cars, he produced a chorus line of the world’s best Bonnes-Mares. These dinners culminated with the night we gathered around the big, beautiful 1962 La Tâche. In his understated way, this was Burt’s pièce de résistance, his capstone to decades of swirling and sharing the best. True to his analytical, Stanford Ph.D. mind, his selection that night followed a kind of mathematical precision by maximizing every factor in the vinous equation: producer (DRC), vineyard (La Tâche), year (1962), and bottle type (an ultra-rare, slower-aging 3-liter). Though I did not realize it at the time, this was Burt’s way of saying farewell through wine. 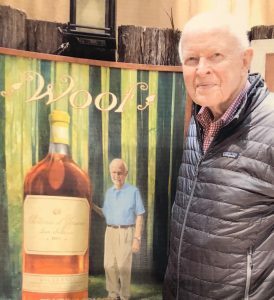 Not only did Burt personify the spirit of generosity that surrounds wine, but his indefatigable embrace of it spoke volumes about how we wine lovers might face our own mortality. Whereas many of those in the late stages of a terminal disease would understandably retreat to a corner, he instead choose to be among people, eating delicious food, drinking sublime wine, and basking in the special bonhomie that happens, almost magically, at the table. It did not matter that he was in a wheelchair and tethered to an oxygen tank; he sought to be in the mix. In doing so he exemplified the spirit which draws so many of us to the epicurean experience — that feeling of fellowship and satiety of the soul that brings us closer, however briefly, to what it truly means to live. Thank you so much, Mark, for this touching piece. Grove each summer. He taught me a lot of his wine knowledge and I got to taste the absolute best true to his exact descriptions. I certainly miss Bert and very often think of him and his wonderful ways. He was one of the most comfortable persons to be with. You captured Burt’s generosity and love of family friends and wine. Nicely done Mark! What a moving testimony to friendship, generosity, and the magical pleasure of wine shared with others. Wow, a beautiful, heartfelt and very well-written tribute. Drink a toast to Burt with the next special bottle you open! This is such a beautiful and thoughtful tribute to Burt ! Thanks for putting into words so much of what we all knew about this extraordinary man. Mark — very thoughtful touch, no doubt appreciated by everyone who had the exceptionally good fortune to have known Burt. If there’s a special place in heaven for wine lovers, Burt must surely be smiling. What a beautiful tribute to Burt, a life well lived, his love and appreciation of great wine and the lasting joys of friendship. Clearly Burt recognized in you all the hallmarks of a fellow oenophile.